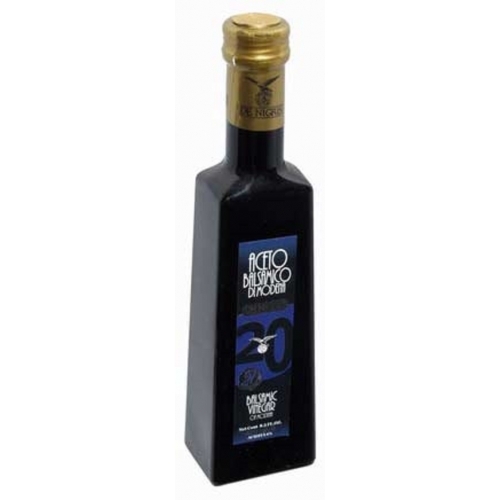 De Nigris 20 Star Balsamic Vinegar. 250ml. Home > De Nigris 20 Star Balsamic Vinegar. 250ml. Balsamic Vinegar of Modena is an ancient product having been recorded in the royal archives of Emperor Henry Il in 1046, when he gave some as a gift to Countess Matilde of Canossa. At that time it was used as an elixir and the recipe was a secret, passed from father to son. Since then, Balsamic Vinegar has been known as a precious condiment with special therapeutic properties. It is the essential garnish for an exquisite tabletop. Artisan quality Balsamic Vinegar of Modena is made using ancient procedures. The process begins with careful selection of the Lambrusco and Trebbiano grapes, grown in the Modena region. They are ideal for the high sugar content required for production. These grapes are pressed and the resulting juice called "must" is heated in copper cauldrons until the volume is reduced through evaporation to about 40% of the original weight. The liquid is then decanted into wooden barrels (chestnut, oak, juniper and cherry) and left to age and transform into vinegar. As the time goes by, part of the liquid evaporates and part of the liquid is absorbed into the wood. This is the moment called "rincalzo" which happens in the period of grape harvest. The liquid is transferred into smaller barrels while the new "must" is added to "top off" the bigger barrel. And so continues the process.